I’m always glad when I can get my hands on a gaming mouse, and NZXT was nice enough to send over the Avatar S for me to review. The Avatar S has a 1600 DPI laser sensor right out of the box, and it can be adjusted by installing the drivers for 1600, 800, or 400 dpi settings. You might notice in the image how there is a blue light, which will change color when those dpi speeds are changed. It has a tracking speed of 30 inches per second, which makes the cursor quite fast. What makes the Avatar S a “gaming” mouse is that it has five buttons instead of the usual three (left, scrolling, and right). The other two are on the left and right sides of the mouse, and, once the drivers are installed, the user can program all kinds of macros with 16KB of onboard memory. The user can also change the orientation from left and right handed, and I can imagine that something like this can really improve one’s game. 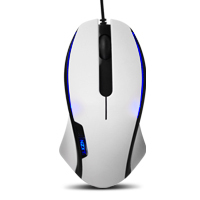 Clearly, I need to be more into MMORPGs to really appreciate the subtleties of the Avatar S.
If you are the type who would appreciate a mouse like this, head over to the NZXT site and check it out for yourself. The current price on the online store is about $39.99. This looks like a very nice gaming mouse, at the moment my son uses a logitech mouse. I shall be keeping this one in mind perhaps for a spare mouse as he is an avid gamer and it’s very reasonably priced.